This special marketing program celebrates those products and services that show the greatest promise according to the country's most tech-savvy educators. Awards will be judged by Tech & Learning magazine. TCEA exhibitors may submit a product for consideration by one or more of these leading publications, and may submit multiple products for consideration. 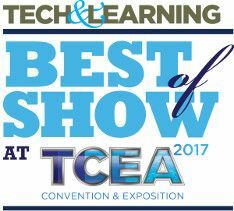 Here’s how it works: Selected Tech & Learning advisors will scour the show floor at TCEA 2017, investigating the latest and greatest announcements from participating vendors. The judges will each rate their impressions on a sliding scale and decide which technologies could have the most impact in the classroom and thus deserves the “amazing” moniker. The recipients will be announced on TechLearning.com before the conclusion of TCEA 2017. Winners will receive a certificate and will receive a mention online and in the print March issue. You may enter as many products as you'd like.